More and more doctors are including alternative therapies – such as acupuncture, yoga, and herbal treatments – into their quest to prevent or cure disease in their patients. The following list was compiled after consultation with hospital administrators and doctors who specialize in complementary and integrative medicine. Keep in mind that most of these doctors do not administer any of these therapies themselves; rather, they work with – or make referrals to – highly trained practitioners of these alternative therapies. 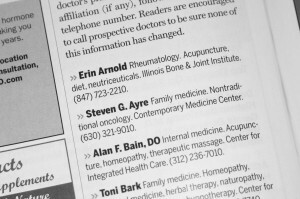 Unless otherwise noted, all the people on this list are MDs; the abreviation “DO” indicates a doctor of osteopathy, and “DPM” denotes podiatric medicine. Doctors names are arranged alphabetically. Where applicable, the doctor’s primary area of expertise (such as internal medicine or rheumatology) follows his or her name. The next item lists some of the alternative therapies recommended by these doctors; some doctors may employ additional therapies besides those listed here. Finally, we include the doctor’s primary hospital or medical-group affiliation (if any), followed by his or her telephone number. Readers are encouraged to call prospective doctors to be sure none of this information has changed. 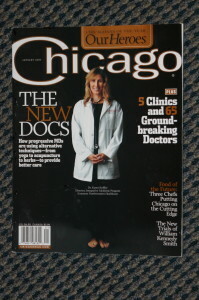 This feature presentation included mention of “5 Clinics and 65 Ground-breaking Doctors.” Steven G. Ayre, MD was selected as one of these 65 Ground-Breaking doctors in the Chicagoland area. This honor was given in recognition of Dr. Ayre’s unique dedication and perseverance over thirty years, working to implement a kinder and gentler form of cancer chemotherapy treatment called Insulin Potentiation Therapy. Congratulations and best wishes to Dr. Ayre on his present successes with IPT, and for his certain more widely acknowledged successes in the near future!